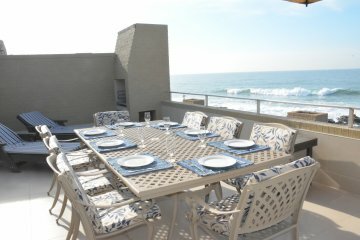 This luxurious self-catering apartment is right on the Ballito beachfront and has a 180 degree sea view. It is modern, spacious and fully equipped. 4Frinton is an exclusive, upmarket, self-catering apartment, right on the beachfront. The spacious living room is equipped with a leather lounge suite, 55” Full HD LED Smart TV and DSTV (all channels). Free Wireless Internet is available in the apartment. The luxurious apartment offers you open plan living, a private patio with built-in braai plus gas braai, 8 seater patio set, sun-loungers and large umbrella. Folding stagger doors open up fully to extend the Living Room and Master Bedroom onto the large patio, from where you have a 180° view of the ocean. The modern, fully equipped kitchen comes with a Gas stove, Dolche Gusto Coffee machine, Washing machine, Tumble dryer and Dishwasher. Dishcloths are provided. A cleaning service is provided on weekdays free of charge. Amenities (Hand and body lotion, Conditioning shampoo, Bath & shower gel and Soap) is provided upon arrival and toilet paper is provided throughout your stay. We are on the Promenade, from which you walk right onto the beach. The beautiful 2.5km long Prominade allows for walking or jogging along the beach front. Dolphins are common on this stretch of the North Coast shoreline, hence the nickname Dolphin Coast. Within 5 minutes’ walk or a few minutes’ drive from a variety of fabulous restaurants and only 15 minutes’ drive from King Shaka International Airport. The complex offers secure parking and a swimming pool.